Hey guys! My name is Mihail and im a 3d artist in video game and film industry. My buddy and I have come to the conclusion that IF players see new shiny things implemented in game, they will want to play more and thus increasing population. My goal is to get the game running again and maybe attracting people with actual cool looking gear / weapons. 3 years ago, Leonis asked me to make weapons for rose's egyptian theme. Saddly, when he got the weapons, he also left the company and thus the weapons died with him. I had to stop playing for a bit because i was really busy but im back and my love for the game has brought me here. I just want to see people running around with cool weapons so i offer my support to every one of you. obviously these were just quick concepts and need to be Rose'fied to fit the Rose style, but they can still work in game and attract people. Once again, i have low and high res versions of these. I also have a shot of egyptian weapons from 3 years ago, so if any of you are interested, pm and I'l gladly send you some more examples. This is the red dragon theme i came up with for Rose, and I hope you guys will be interested and think this is a good idea! Maybe we can attract people back to the game / get new interested people. I can come up with weapons quickly and on the fly and with all the time i have on my hands I can make them high quality. Thanks for your support! Once again, I hope you guys are interested! PM me if you need anything at all regarding my work! Edited by HugeMalaka, 30 May 2018 - 07:41 AM. Wow, this is awesome! These weapon skins look amazing! I hope this gets seen through! Looked through your portfolio, awesome stuff dude. This is pretty sad. We did get level 240 weapons which were 'Egyptian themed' which went alongside the 240 armor, though some of the weapons were quite lackluster. For example, the one handed blunt weapon looks like it would be a level 40 weapon instead of the highest level one of that type. 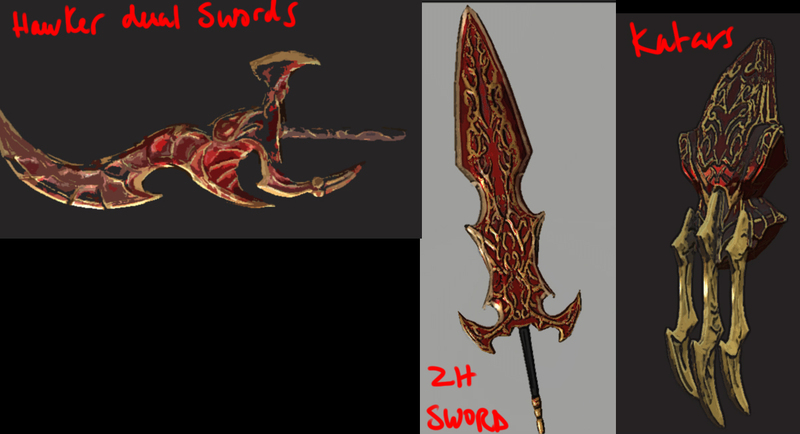 There was a weapon design contest 2 months ago, and the winning entries were to be made in game (as item mall costume though).Good luck with submitting any new weapon models. Wow! Your design looks like a crossover from other mmorpg game which will be a breath of fresh air. If you ever create the rest of the weapons, I hope you use the same palette you used for that 2H-sword. Not just the design, but also its coloring scream "assassin", "bloodbath" and "anarchy". I just hope that if they put these in game that they give justice to the color hue. Coz more often than not, the costumes they recreate from submitted costume designs become less impressive compared to original art once in game. Also a thumbs up and a bunny for you. Thanks a lot guys! we need to get more people involved! Here is another shot of a weapon i made as a test. Unfortunately Only i can see it in game, but its a working weapon regardless. Edited by HugeMalaka, 30 May 2018 - 12:57 PM. How you been Mik? See you still trying out artwork for ROSE. thanks a lot hun im glad you like em haha! Would love to play even more with that Katar on, looks good along with king set. Edited by Kayzerian, 08 July 2018 - 06:18 PM.